Clearly one of the most portable versatile signs on the market! The Folding Swing Sign was introduced to the Plex range in April 2013. The goal was to design and manufacture a swing sign that would be robust enough to withstand the daily grind of pavement life, but have the added benefits of being easy to carry, and to fold flat for convenient storage. Ensuring that the folding swing sign is a match for many years of daily use it is manufactured to a high specification, utilising thick steel tube, stainless steel hanging brackets and heavy-duty plastic feet. The pivoting mechanism that allows the sign to effortlessly lock open to the correct position is an innovative design that has been rigorously tested to ensure product longevity. It was also important that as well as encompassing the needs of the end user; we also tailored the folding swing sign to fit in with ever decreasing budgets. Cost effectiveness was important to us, we wanted the perfect blend of features and price, and so the Folding Swing Sign was born! The list is endless when it comes to the types and amount of businesses that the Folding Swing Sign would benefit. The Folding Swing Sign can also fit easily into a car boot, so is fantastic for taking with you when you are out on the move. This enables you to carry your business brand out onto a nearby pavement/roadside to engage with even more prospects that would otherwise have passed you by. The folding swing sign is your silent first point of contact salesperson. Generating more sales and driving your business forward. When you think about it, could you really afford not to consider the folding swing sign? 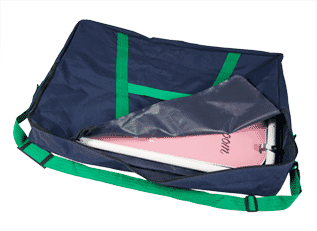 We can also offer a carry bag that fits the folding swing sign like a glove. That means that it offers further protection from any scratches during storage or transportation, further extending the longevity of your sign. 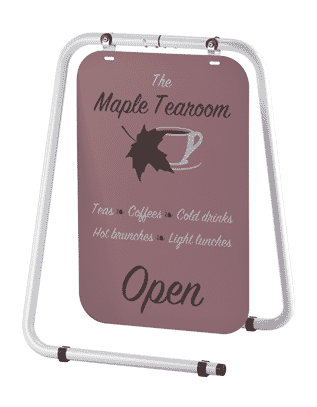 The Folding Swing Sign is a stock item, and available for immediate despatch. If you have any questions about this product or any other in our range, please contact our dedicated and experienced sales team.